Never neglect pruning. The ideal is to prune while the branches are small. This avoids making big cuts later on. As a general rule, little pruning is needed before planting, apart from shortening damaged or overlong roots back to sound tissue. But any dead, damaged or overlong shoots should also be shortened back to a good healthy outward pointing bud as a matter of course. Most get by with relatively little pruning, provided they have room to grow. The majority are best pruned in summer or autumn. Pruning in the early years is largely a matter of selectively thinning out any overcrowded, crossing, inward growing, damaged or diseased branches. Aim to maintain a fairly open framework. As a general rule these trees require minimal pruning, but if necessary it should be attended to in summer. It is usually a case of shortening back any straggly, untidy or misplaced shoots, together with sanitation pruning if required. One of the most important pruning tasks with any single-stemmed conifer is to prevent forking of the main stem. Remove any secondary main leaders as they develop. Leave only one — the strongest and the straightest. As with deciduous trees, remove the bottom branches of older trees as and when they obviously come to the end of their useful life. With any shrub begin by shortening back or cutting out dead, dying, damaged or diseased growths back to a good bud, sideshoot, branch or trunk. At the same time, cut out inward growing, crossing, straggly, untidy, misplaced and, in the case of non-weeping plants, downward-growing shoots. Then deal with suckers and reverted green shoots. Many suckers are unwanted growths which arise at or near soil level or, in the case of standards, higher up the stem. They are commonplace on shrubs which have been budded or grafted during propagation, so that a superior gardenworthy variety can be grown on the roots of another closely related plant. Sometimes after budding or grafting suckers break away from the roots. These need to be ruthlessly cut back, as near as possible to their point of origin. If left unchecked they will take over, smothering out the sought after main plant growth. Shrubs such as roses and rhododendrons are among the most likely to have suckers. But not all suckers are bad. Some shrubs, including kerria and hypericum, along with fruits like raspberries, have a natural suckering habit. They produce suckers identical to the parent, and these suckers are suitable to detach for propagating purposes. Reverted shoots are inferior growths which arise amidst the foliage. They are frequently to be found in variegated trees, shrubs and climbers. Strong-growing reverted green shoots appear amongst the variegated. Cut these out promptly, back to their point of origin. Otherwise they will soon crowd out the less vigorous variegated foliage. 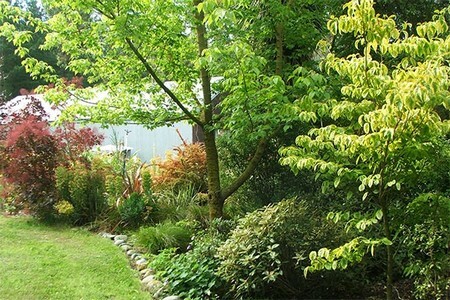 Although many shrubs will grow and put on a good show of flower and foliage colour with nothing more than the above routine treatment, many respond to a regular programme of more specialist pruning. And for pruning purposes, most shrubs can be categorized into certain, fairly clearly defined groups, according to their flowering habit and pruning needs. When in doubt as to the flowering or fruiting habit of a shrub, don’t start cutting immediately. It is much better to watch it closely, for twelve months if need be, and establish which wood carriers the flowers and fruits and at what time of year. Shrubs which usually flower in spring or summer, on wood formed the previous year. These shrubs are pruned immediately after flowering is over for the season. Cut back all flowered wood to one or two buds. Leave the bulk of the new season’s growth alone, as it is needed to replace the spent wood and carry the following year’s flowers. However, cut out any weak new shoots. Some of these shrubs are more easily dealt with by clipping over with shears at about 90% flower fall. 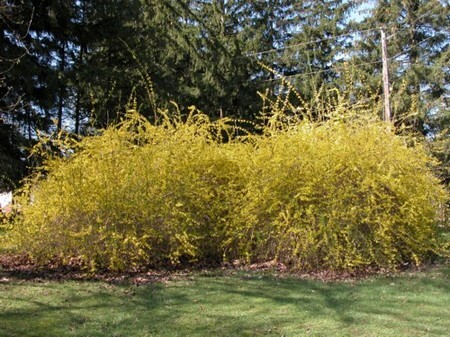 A formally treated forsythia is a good example of a shrub which responds well to this treatment. Shrubs which flower mainly during summer, on both new season’s growths as well as on wood formed in the previous year. Selectively thin these shrubs immediately after flowering. Remove up to slightly more than half of the previous season’s flowered wood. Also cut out the weakest of the new shoots; then shorten back new growths by one third to half their length. With berrying shrubs like pyracantha, selectively thin out fruited wood in spring instead of at flowering time, otherwise much of the berrying effect will be lost. Shrubs which flower in late summer and autumn at the tips of new season’s growths. Shorten all flowered wood back to within one or two buds of the main framework in late winter or early spring. This encourages an abundance of new flowering stems. Naturally neat and slow growing shrubs, requiring little or no pruning apart from shortening untidy, straggly or misplaced growths. Often young shrubs belonging to this group — rhododendrons and azaleas for example — benefit from deadheading immediately after flowering for the first few years. Remove the old flower heads back to just above a leaf. And in the case of rhododendrons and azaleas, take care not to damage the following year’s buds which are situated at the base of the spent blooms. 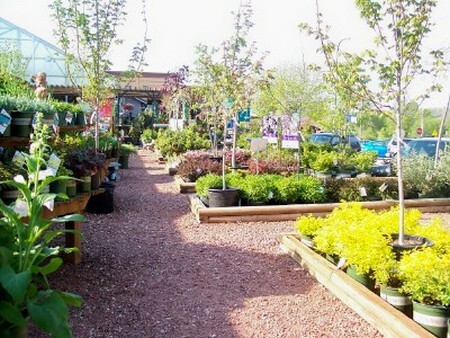 Shrubs which are grown mainly for foliage effect and respond to clipping. Evergreens are best clipped in late spring or summer. Deciduous varieties are normally best cut in late summer or autumn. In the case of shrubs with large leaves, take a pair of hand pruners and cut through stems rather than leaves. This avoids the problem of bruised and sliced leaves — and the resulting unsightliness of discolouration at the cut edges. Roses come in a bewildering range of types, varieties, shapes and forms. However, for pruning purposes they can be narrowed down to four main types. Bush varieties are made up of the ever popular HT (Hybrid Tea) or LF (Large Flowered) varieties, plus the floribunda or CF (Cluster Flowered) kinds. Many of these varieties are also grown as single-stemmed standards. Climbers and ramblers can be lumped together for practical pruning purposes, although the keen rosarian may prefer to consider them as two distinct groups. Shrub roses make up a pretty variable group. Only the modern shrub roses are considered here. These are dwarf varieties which produce miniature flowers. They are perfect replicas of their larger-flowered relatives. After autumn planting, shorten back the shoots by about one third their length. In spring both these autumn-planted roses and spring-planted roses are dealt with in a similar manner. Shorten back all growths to within about 15 cm (6 in) of the ground, provided this leaves four or five good buds. Otherwise don’t cut back quite so hard. Climbers and ramblers are pruned more lightly, cutting back main stems to a good bud but within about 45 cm (18 in) of the ground. Any weak growths are cut down to within 10 cm (4 in) of the ground. Shrub roses and miniatures have their shoots shortened back by about half their length in late winter or early spring. Bush roses flower on the tips of new season’s shoots and in consequence are hard pruned in late winter or early spring, as signs of new growth become evident. HT/LF varieties have the previous season’s wood cut back to within about three buds of the older wood. Floribunda/CF roses, being more vigorous than HT/LF varieties, are pruned more lightly, to within about five buds. Standard varieties are pruned in a similar way. Simply treat the top as a bush HT or floribunda, as appropriate. Deadheading is important. As soon as the flowers start to fade, remove the old flower heads or clusters, back to just above a good leaf. This encourages prolonged flowering. In autumn, shorten back all new growths by about one third their length. This enables plants to withstand better the winter buffetting by wind, and takes them safely through to the main pruning season in spring. Tie in the first formed main stems to a support of some kind to create a basic framework of branches. Climbers bloom on new season’s shoots and are autumn pruned. Shorten back all new growths to within about two buds of the main framework. When strong new growths arise from the base, take the opportunity to cut out the weakest of the main stems, back to near ground level, and tie in the new growths as replacements. Deadhead as for bush varieties. Unlike climbers, there is no permanent framework. Ramblers normally flower on wood formed the previous year. These varieties are summer pruned as soon as flowering is over for the season. Cut out flowered wood, back to its point of origin, and then tie in new vigorous, healthy, replacement growths. During the course of the growing season, new growths should be loosely tied into canes, unobtrusively pushed in alongside. This protects them from damage and makes autumn tying in a great deal easier. Modern shrub roses flower on both new and old wood. They are pruned in late winter or early spring when the previous season’s wood is shortened back by about a third. Cut out any dead, damaged, diseased, weak or crossing wood at the same time. In addition mature shrubs should have about one fifth of the old wood cut out each year, in strict rotation. Deadhead shrub roses, unless rose hips are a feature of the variety, in which case leave well alone. Miniature roses flower on young wood. They are cut back by about half in late winter or early spring. During summer, regular deadheading is called for to ensure continuous flowering.